Rising track star Brooke Tucker, headed in to the 2016 UCI Junior Track World Championships looking to improve on her silver medal in the team pursuit from 2015 as well as climb on to the podium in the omnium. Having qualifying third fastest in the team pursuit and looking on track for a medal a disappointing first round ride meant Australia would only finish seventh, dashing Tucker's hopes of pulling on her first rainbow jersey. Initially finding it hard to deal with Tucker was able to refocus and look for redemption in the omnium. Sitting ninth after the first three events Tucker described the feeling as one of the lowest moments she had encountered. Third place finishes in the 500m metre time trial and flying lap on day two kept Tucker's hopes alive but despite her best efforts in the final points race fell short of the medal she had been chasing. Two months on coming to terms with not achieving the results she wanted has been difficult but the 18 year old has come to realise the experience is one that will help her grow as an athlete and a person as she transitions in to the elite category in 2017. 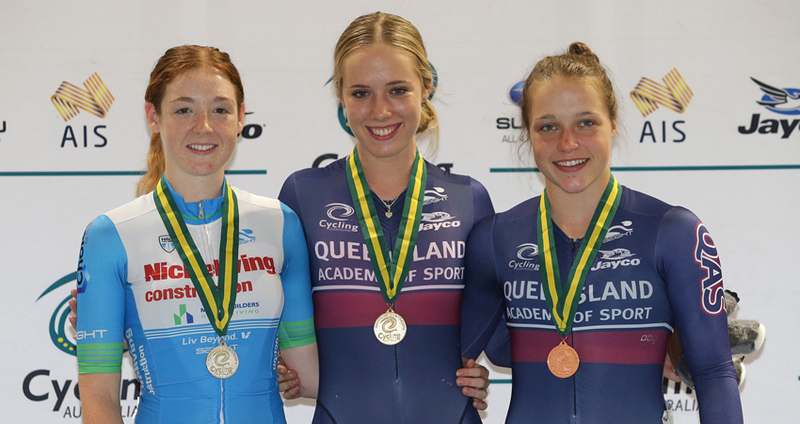 Silver medallist in the team pursuit in 2015 what were your goals ahead of Junior Worlds this year? My goals for this year were quiet big, obviously to go one better in the team pursuit was a big one for me and to podium in the omnium was also another major target both which have been goals of mine for quite some time. Team qualified third fastest in the team pursuit and you came in for the first round against New Zealand, who you had beaten at ITS Melbourne for a spot in the gold medal ride how did it go? It was a very tough to come to terms with, losing that race to be quiet honest and even worse trying to work out why it went so wrong. At the end of the day, we had our race plan, we went out there with every intention to give it 110% and give the Kiwis a run for their money but we just couldn't pull it off. In saying that we gave it our best crack and without a doubt stayed true to the true Aussie spirit. Went on to finish seventh in the team pursuit after silver last year obviously not the result you were chasing? Definitely not the result we were chasing, but in sport especially this sport there are more lows than highs and as I continue this sport, this becomes increasing prominent. That's why I think it's really important to have a thick skin and to be able to handle everything this sport throws at you and still continue to grow and develop not just as a bike rider but also as a person. A young Australian team with Nicola and yourself the only returning members do you think the experience from last year helped you and the team? For sure, having had the experience and gaining the knowledge from the previous year I think was valuable information to pass on to the newcomers. It's all a part of making a stronger team environment, something that this years team I believe did very well. After the disappointment from the team pursuit did you find it hard to refocus and prepare for the omnium? It was a tough pill for not just me but for all of us girls to swallow, and in the early parts it was hard to regain focus. However I was lucky that I had a day to refocus and reset, and I was really looking forward to being able to race again and redeem myself in the omnium. Finished seventh in the scratch race, ninth in the IP and 12th in the elimination race to finish the opening day in ninth on 70 points. How were you feeling after the first day? Happy with how you raced and were positioned overall? No I wasn't, after that elimination race, it felt like the thing that I wanted most for the past year and worked so hard for was no longer achievable, it was a huge kick in the guts if I'm honest and one of the lowest moments I have ever encountered. The only glimmer of hope was that I had my two favourite events and best events the following day. I also had and overwhelming thought of not letting all my hard work and the many that had helped me go to waste, I knew I deserved to be there it was just a matter of believing. Started the second day with third in the time trial and flying lap must have felt good to get day off to a good start? I always knew these two events were my best chance to increase my points. It was an improvement on the previous day and a step in the right direction. You have a sprint background do you think that gives you a big advantage in those two events? I think it gives me an advantage in any event, as speed wins the majority of all events. These two events are essentially pure speed and the flying lap in particular was identical to a qualifying 200m as it was a 200m track. It gave me a chance to compare my time against the sprinters which I found quiet interesting and useful for future reference. Started the points race in seventh just 24 points off the podium how were you feeling ahead of it and what was the plan for the points race? To be so far behind in points, I knew I would have to try something different and couldn't rely on my speed to get points through sprints. I'd have to take laps, something that was unfamiliar territory for me and something that I don't usually have to do in a points race. However I knew it was my only chance to get on the podium and was willing to give it a crack. Finished ninth in the omnium how did the final points race go? Were you happy with your overall performance? The point score was one of, if not the hardest race of my life, but in saying that it was something I was prepared for and had been for a long time. My unsuccessful attempts at taking laps, took their toll in the end and all I could do was hang in for the finish. In those final moments of that race and those that followed was heartbreaking. You mentioned at the end of the omnium not achieving the results you hoped was heartbreaking. Two months on from Junior Worlds has it been difficult to deal with? It has been very hard to deal with or even talk about and still is. However issues needed to be addressed and spoken about and I'm very lucky that I had a few people who were supportive and willing enough to help me come to terms with my experience as hard as it was. Trying to come back from that first day in the omnium was very tough. I've learnt in those situations to stay positive and to continue to believe in myself and my abilities. I now know if I'm not confident in my own abilities it will show in my racing and there's simply no room for self-doubt on a world stage. I also now know just how important it is to communicate with those who are in your corner and to discuss the situation at hand. Do you think dealing with the disappointment has made you stronger mentally and will benefit you as you move in to the elite ranks? I believe everything that we go through in life, whether it be good or bad provide valuable lessons and holds he potential to develops us a person. There's that saying "what doesn't kill you makes you stronger" and in my opinion this couldn't be more correct. Without a doubt dealing with this disappointment has changed me as a person and athlete and I guess I'll find out just how much when I return to racing. Over your two years in the under 19 category you claimed national titles in the omnium and sprint, twice selected for Junior Worlds and won a Junior Worlds silver medal can you take confidence from that as you move up to elite? I'm very grateful to have been given these opportunities, and have certainly used my time as a junior to experience as much as possible, by exploring both disciplines and have had a lot of fun just riding and racing my bike so I can definitely take confidence from that. I'm excited to move up to the elite ranks and looking forward to the challenge I know it will present. You have combined sprint and endurance as a junior moving up to the elite category do you plan to continuing with both or are you going to focus on one? No, I don't believe it is possible to continue both in the elite ranks as much as that disappoints me. I've put quite a bit of thought into it and spoken to a lot of people who are helping me come to a decision to a final decision.